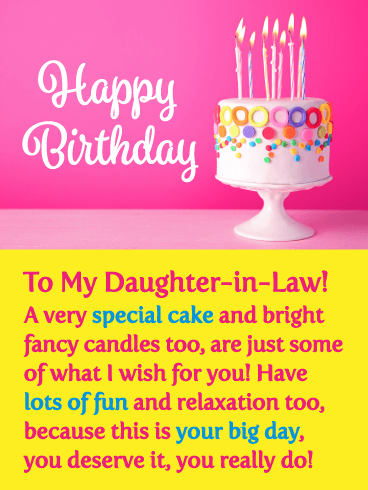 With its bright colors and sprinkle-topped cake, this birthday card will make celebrating your daughter-in-law's birthday even sweeter! A festive design and cheerful message is sure to leave her smiling bright, knowing you took the time to wish her a day that's as amazing as she is. A beautifully wrapped gift tied with a bow is the perfect way to wish your daughter-in-law a happy birthday. This lovely card comes with a heartfelt message, letting her know that you hope her celebration is filled with lots of extra special surprises. Whether you see her all the time, or are thinking her from miles away, she's sure to be touched by your thoughtfulness. 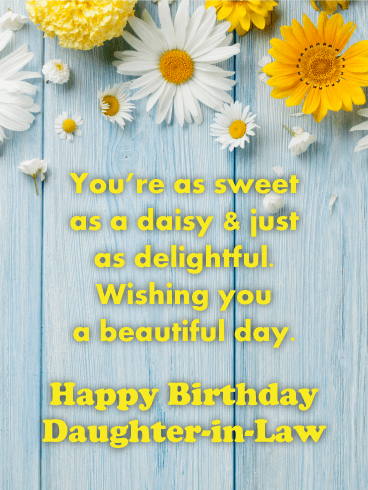 An adorable daisy motif brings plenty of delight to this birthday card for your daughter-in-law! It's a chance to celebrate her sweetness while wishing her a great day and year ahead. After all, she's such a special part of your family, so she definitely deserves it. 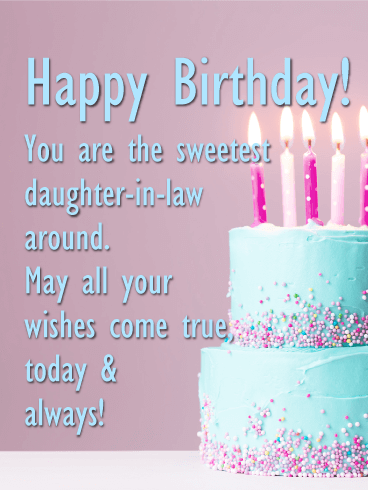 This vibrant and beautiful birthday card carries along your best wishes for your daughter-in-law on her birthday. Bright flowers and a pink polka dot gift add charm & whimsy. And the words bring even more of a special touch, reminding her of how much she means to you, today and always. 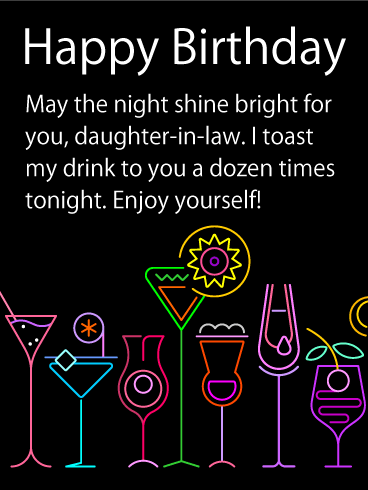 Your daughter-in-law's birthday calls for a celebration, which is perfectly captured in this festive & fabulous card! An outdoor party, complete with pink Champagne, lets you raise a toast to her in style, while the words above let her know how wonderful you think she is, and that you're wishing her all the best in the year ahead! 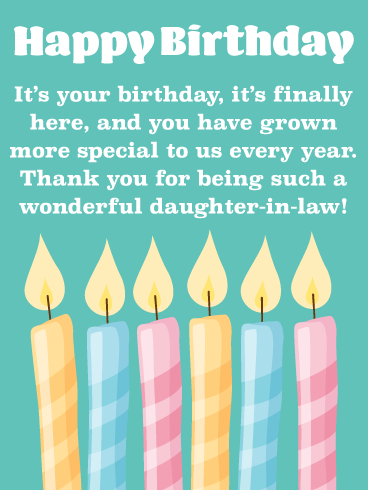 This uplifting birthday card for your daughter-in-law will make sure she has a fun-filled day. A bunch of pretty pink balloons are set against a blue sky backdrop to send her spirits soaring as she celebrates. And your wish for her to be surrounded by all the people she loves is sure to have her smiling and feeling special. four patchwork heart ornaments for a lovely touch. And the message below lets you send along your love for her in the most beautiful way. She's sure to be touched by your kind & caring gesture on such a special occasion. 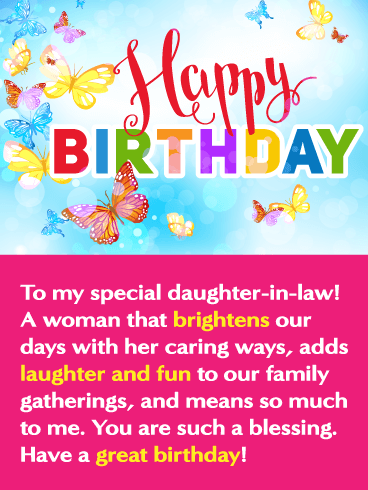 You have the sweetest daughter-in-law around, and her birthday is the perfect opportunity to express how you feel. This gorgeous card is decorated with a two-tiered blue cake that looks absolutely delicious, topped with brilliant pink candles to brighten her celebration. It's a wonderful way to wish her well, not just today but every day after. 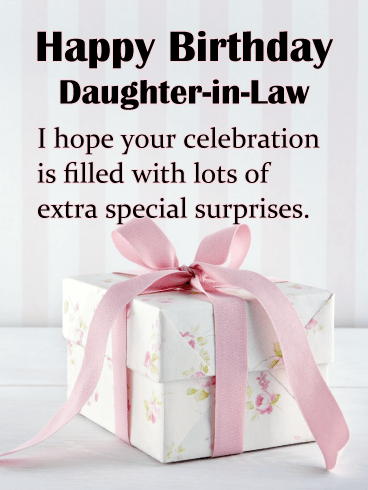 Gift your daughter-in-law a loose and relaxed birthday! She's a classy girl who knows exactly what she wants. Her career. Her hobbies. Her drinks. Her spouse. Anticipate her needs for her birthday, and send her a card full of wishes for a sensational day and the relaxing call of a pair of martinis. 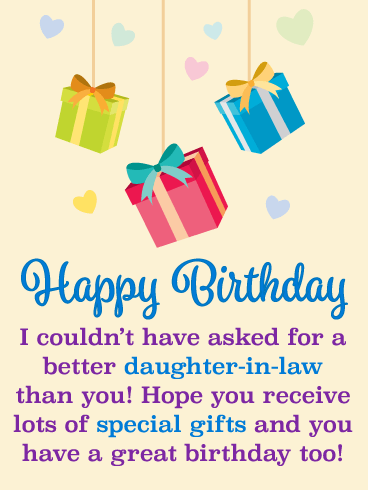 Make sure your daughter-in-law has a great birthday by sending her this birthday card! Give your daughter-in-law the gift of unwinding and relaxation for her birthday! Whether it's going to be a crazy night or just a cozy, intimate celebration, your daughter-in-law deserves a fabulous birthday. Let her know that today you are toasting to her health, happiness, and success. She’s got an incredible life ahead of her, and you're excited to be a part of it. 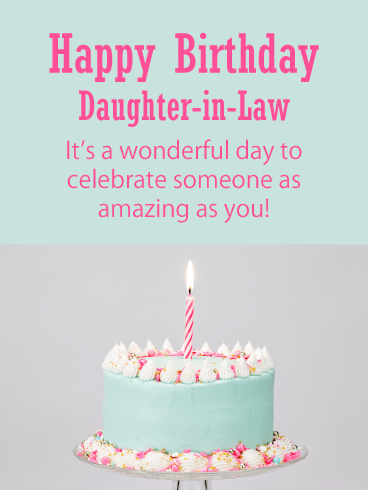 Make your daughter-in-law's birthday incredible with this festive birthday card! You gained a daughter through marriage, which is incredible because that means she willingly asked to be included in your family shenanigans. You love her all the more for that. 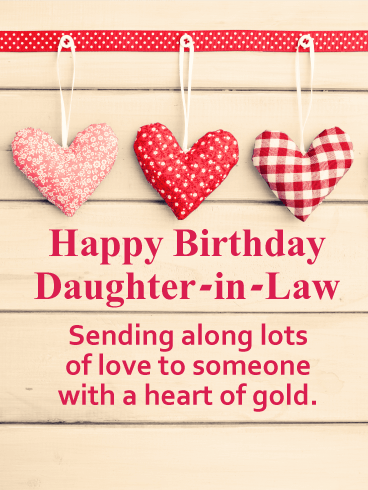 Fill your daughter-in-law's birthday with blessings and wishes for an incredible day, making sure she has a great time! 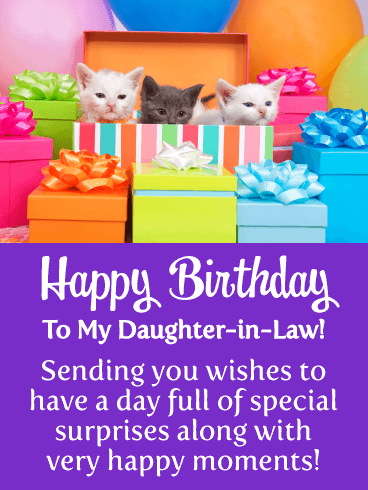 Make your daughter-in-law's birthday incredible! Send her this festive birthday card to kick off the party. Balloons, confetti, and of course a bucket of love from you to her. Families find each other in numerous ways, and you're so happy she found her way into yours. 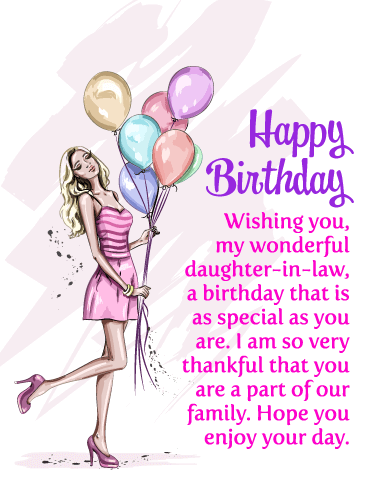 Wish her all the best, and be a fabulous part of your daughter-in-law's birthday. 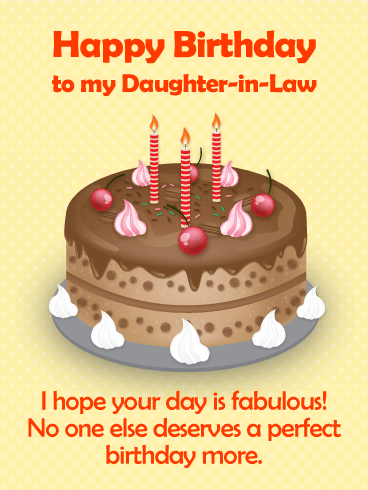 Ensure your daughter-in-law's birthday a party to remember with this delicious birthday card! Make her day a sweet memory with this chocolate-cherry cake. It's a loving reminder for her to have a fabulous day. 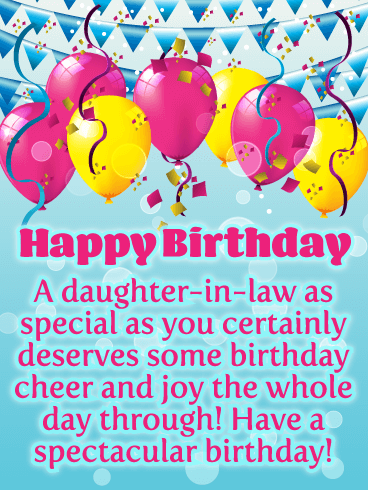 Plus it lets her know not to forget to celebrate her birthday twice – once with each side of the family! 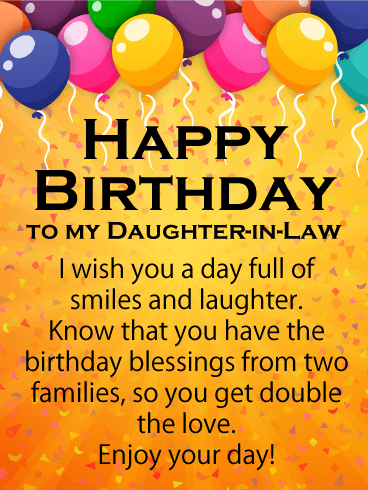 Wish your daughter-in-law a happy birthday and watch her smile! This purple and gold celebration birthday card is going to make your daughter-in-law's special day even better! The purple and gold balloons, along with the streamers look fabulous and represent the special occasion at hand. 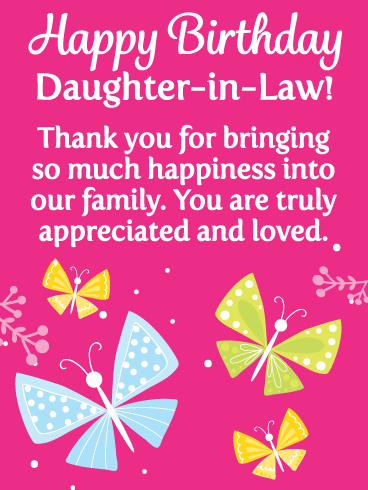 This birthday card lets your daughter-in-law know that you appreciate her kind ways and that you are thankful for her. She will be touched by your caring words. 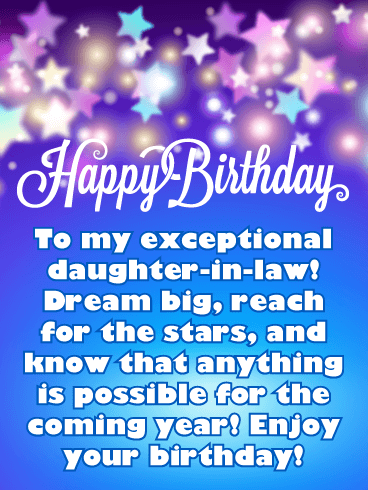 Wish your spectacular daughter-in-law a great birthday with this exciting greeting card today! Everyone looks forward to the special presents they will receive on their birthday. That's what makes this birthday card so great. 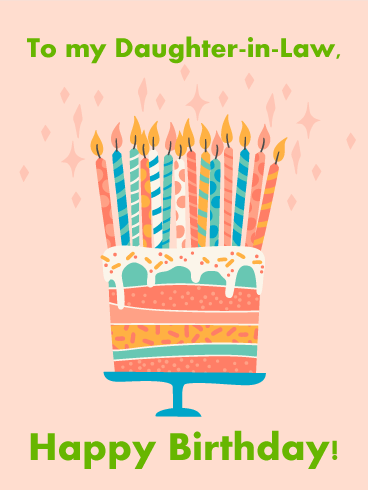 It features perfectly wrapped colorful and festive birthday presents! 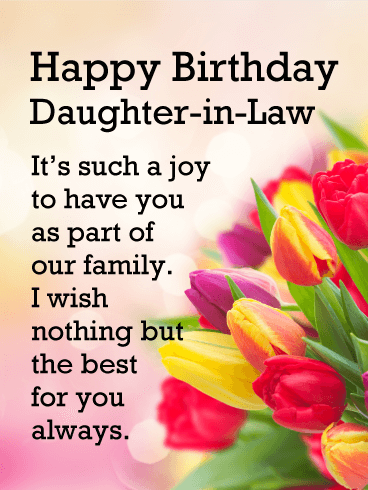 Your daughter-in-law will be thrilled to receive such a wonderful greeting card and she will appreciate that you are sending such thoughtful birthday wishes her way. Get these presents and party hats over to your daughter-in-law right way so she will receive them in time for her special day! 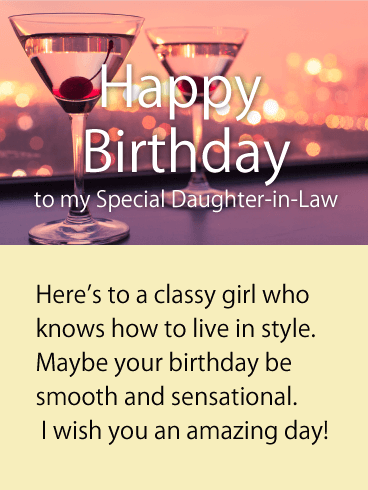 If you are looking for a birthday card that will really impress your daughter-in-law, you are in luck! This sensational greeting card features amazing desserts that your daughter-in-law is going to just love! 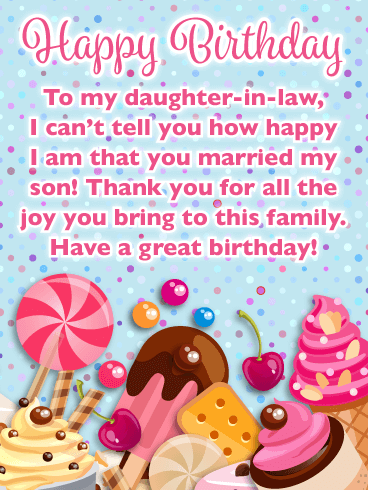 An ice cream cone, popsicle, milkshake, lollipop, cherries, and more, fill this greeting card with excitement! Your daughter-in-law will read that you feel she brings joy to your family. So special! Send these outstanding treats to her today! 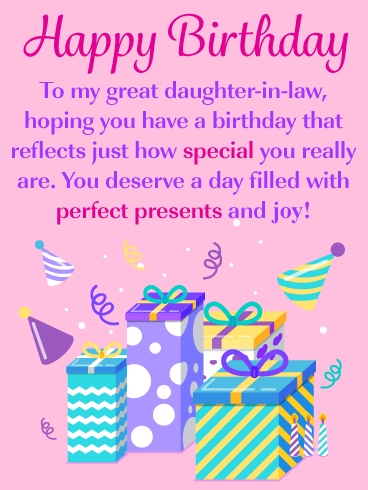 Send a bright and exciting birthday card this year to your daughter-in-law that expresses just how important her birthday really is! This greeting card showcases exciting celebration fireworks that are bursting in the air. Such a sight to see! 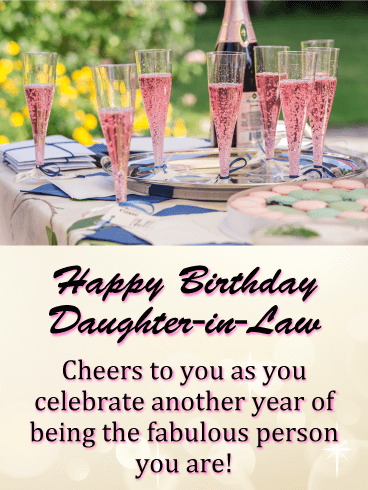 The bold vibrant pink lettering looks fabulous and will let your daughter-in-law know you want her to have a great birthday! Shoot these fireworks over to her today so she can have a sensational day! This eye-catching birthday card displays vibrantly colored pink and yellow balloons and fantastic celebration streamers! It will surely get your daughter-in-law excited about her big day. 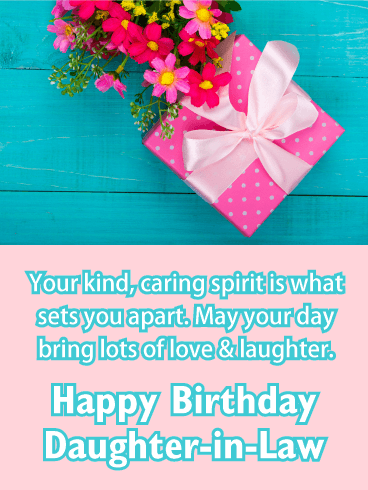 This birthday card will let her know that you feel she is special and that you wish her cheer and joy! The thoughtful birthday message will put a smile on her face and brighten her day! Get these balloons over to your daughter-in-law in time for her big celebration! She will appreciate it. 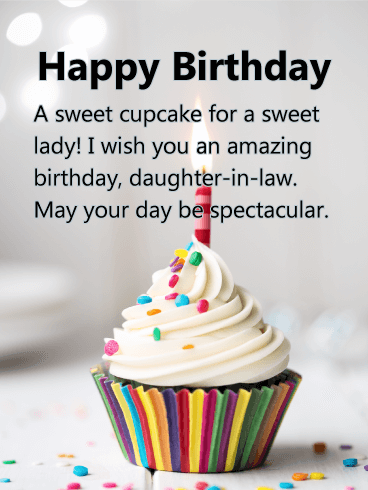 Your daughter-in-law's birthday is finally here, and now it's time to wish her a happy birthday and tell her how you feel! 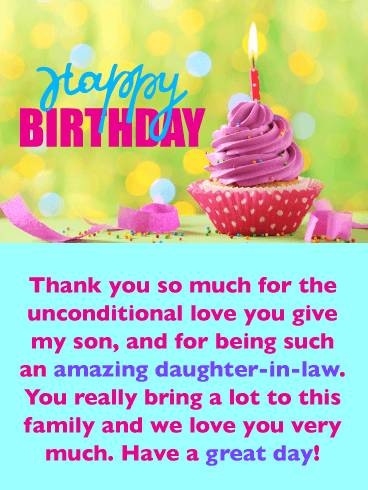 This birthday card will take care of this for you with its thoughtful words of how she has grown more special to you after each year. It will make her happy that she married into such a loving family. The candles are lit and ready for her to make a wish so send them to her today without any delay! Get your daughter-in-law excited about her birthday by sending this birthday card that features beautiful gift boxes! 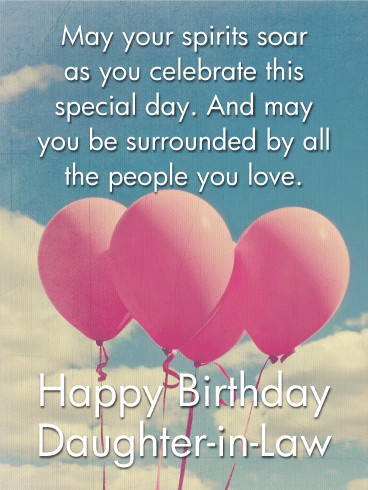 They are surrounded by pretty hearts that add an element of love to this wonderful birthday card. When she reads that you could not have asked for a better daughter-in-law than her, it will warm her heart. 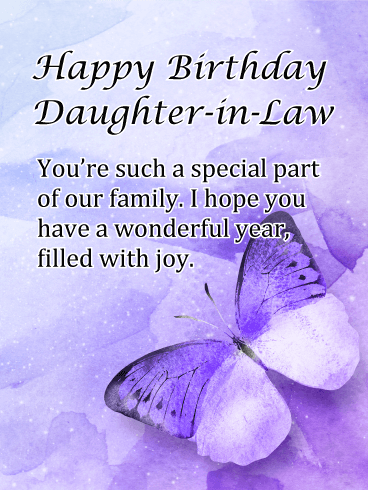 Wish your daughter-in-law a great birthday with this fantastic greeting card so she knows how much you care! Your son married a wonderful woman and today is her birthday! This is an excuse to tell her just how blessed you feel that she is your daughter-in-law. This special birthday card showcases an amazing piece of birthday cake with beautiful celebration balloons surrounded by pink and gold confetti. 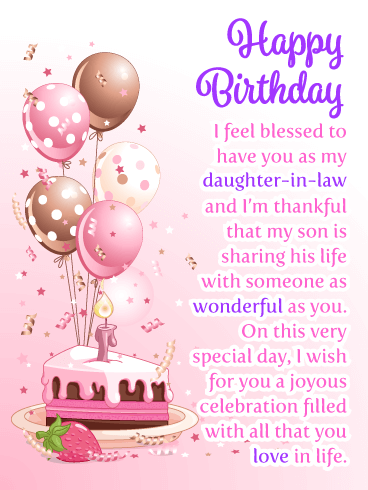 The faded pink background gives this greeting card an impressive creative look and your daughter-in-law is going to love it! Does your daughter-in-law love cats? If so, then she is going to just adore this kittens and presents birthday card. Imagine opening a birthday present only to find 3 cute kittens! This birthday card is filled with vibrant colored gift boxes, birthday bows, and balloons. What more could you ask for! 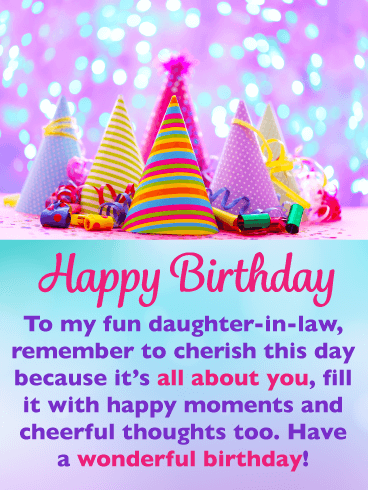 Send your daughter-in-law wishes for a day full of surprises and happy moments, she will be so glad that you are thinking her on this very special day. A birthday card such as this is reserved for a daughter-in-law that deserves the best! It features a birthday cake that will grab your daughter-in-law's attention and add a little excitement to her day! This birthday cake is so perfect that it will make her feel special that you sent it her way. 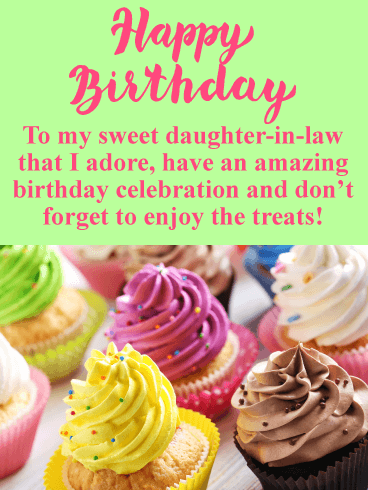 Remind your daughter-in-law to have lots of fun on her big day, and let her know you are thinking of her by sending this birthday card today! 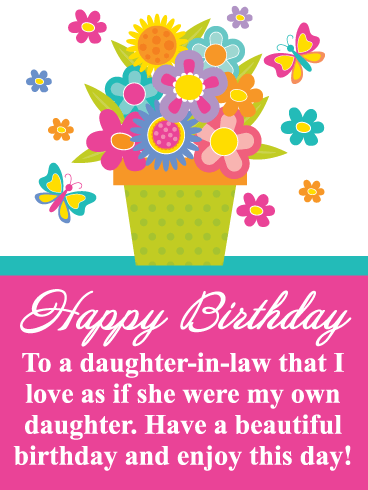 Send your daughter-in-law a birthday card that will get her special day off to a great start! This greeting card showcases an exceptional pink frosted cupcake and a shimmering green background that just looks sensational! When your daughter-in-law reads that you are expressing you love her and that you feel she is amazing, she will be touched. Send this perfect cupcake over to your daughter-in-law today, she will be so happy you did! 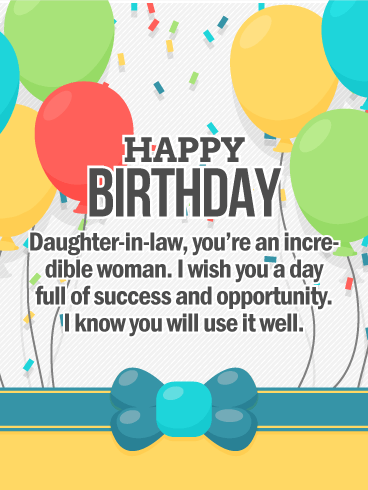 If you have a sweet daughter-in-law that you really adore, then this birthday card would be perfect for her. It showcases the best birthday cupcakes ever, complete with colorful frosting and sprinkles! Who wouldn't be excited to see such yummy desserts. Be sure to send these amazing cupcakes on their way so your daughter-in-law can enjoy them today! She will be thanking you for being so thoughtful! 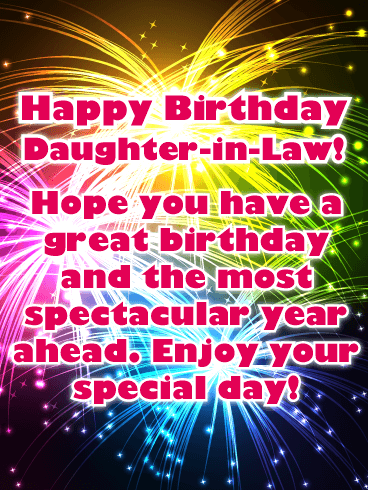 It's your daughter-in-law's special day so wish her a happy birthday with this dazzling greeting card! Sparkling fireworks are displayed in honor of her birthday and will add some excitement to the occasion. 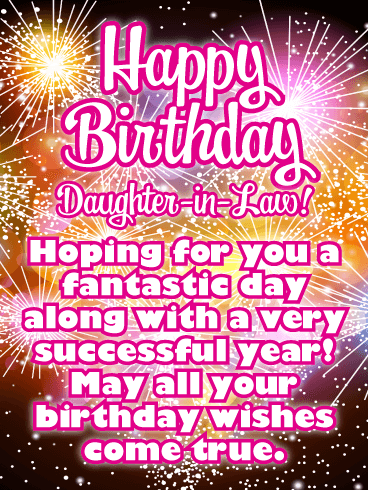 The message stands out with bright pink and white to tell your daughter-in-law that you are hoping she has a fantastic day and a successful year! It will also let her know that you hope all her birthday wishes come true! 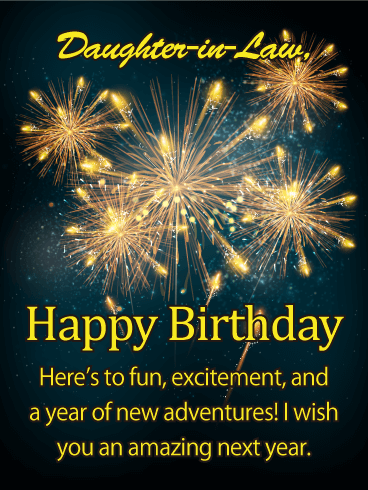 Send this exceptional birthday card right away so she can see these impressive fireworks today! 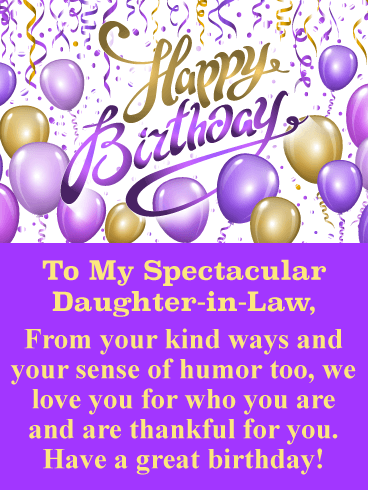 Daughter-in-laws are very special and deserve a birthday card that will add joy to their day. This beautiful birthday card features a lovely illustration of a woman holding birthday balloons. It's the perfect greeting card if your goal is to make your daughter-in-law feel special. She will be touched when she reads you are happy she is a part of your family. It will make her birthday even better! 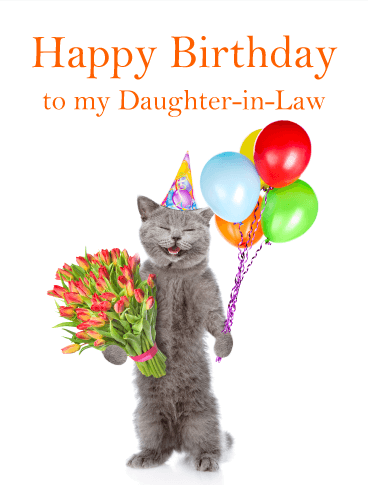 Be sure to send this pretty birthday card to your wonderful daughter-in-law soon! 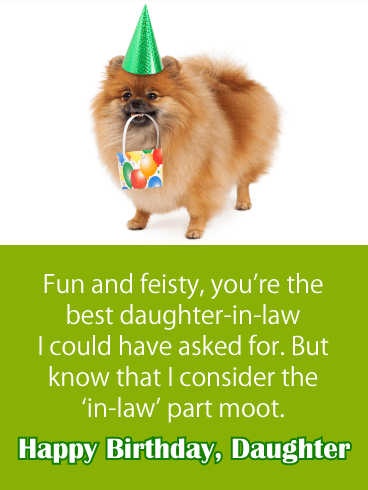 Send this adorable puppy over to your daughter-in-law for her big day! She will be sure to smile the moment she sees this birthday card! 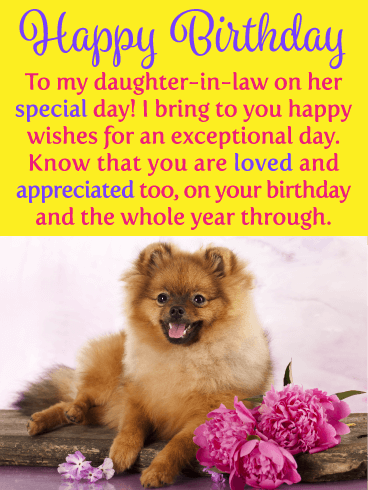 The cute puppy has a joyful look on his face, and that can only be because it is such a special day, your daughter-in-law's birthday! So send this little guy over to your daughter-in-law today, he is eager to wish her a happy birthday right away!